Availability Usually leaves the warehouse in 5-7 business days. Built In Stitch Length Regulator, Laser Point Guide, Automatic Thread Trimmers, Big M Bobbins, Direct Drive Motor, Metal Gears, No Belt. Direct drive motor with metal gears without any belts makes the machine more responsive and quieter. Specifically the motor is built into the head on the main shaft and the lower shaft is turned by a gear, there is no belt noise. 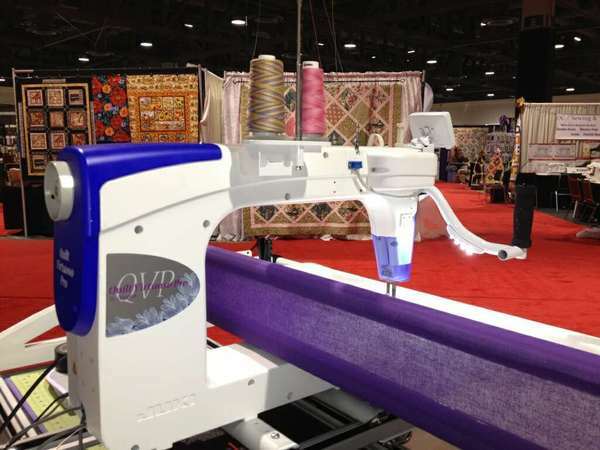 The Juki TL-2200QVP Quilt Virtuoso Pro Long Arm Quilter is the newest Long Arm Quilting Machine on the market and from Juki in Japan and the only one on the market with top and bobbin thread trimmers. It has 18x10" or 180 square inches of arm space, compared to 118" for Tin Lizzie 18x6", 144" for Handiquilter Avante 18x8", and 144" for Tin Lizzie 24x6" heads. That's 25% more arm space more than 18x8 or 24x6 arms. THE TOUCH SCREEN PANEL HAS MANY OPTIONS. AUTOMATIC STITCH REGULATION OR MANUAL SPEED CONTROL, UP TO 16 SPI STITCHES PER INCH ON STITCH REGULATION. NEEDLE PROGRAMMED TO ALWAYS STOPS UP OR ALWAYS STOP DOWN, AUTOMATIC THREAD TRIMMING OR MANUAL COMMAND, ETC. 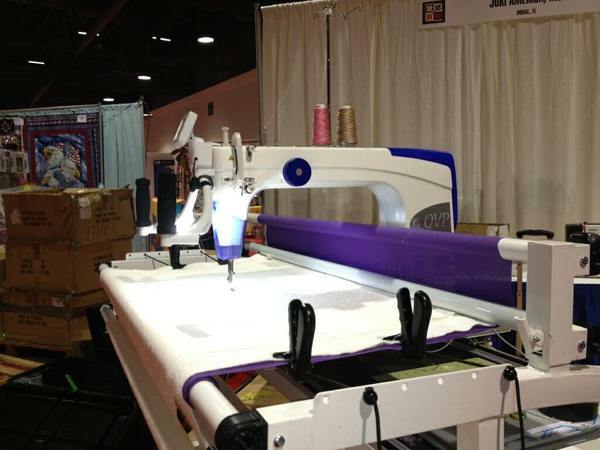 18.25" x 10.25" oversize arm space to right of needle is the largest workspace of any 18" longarm on the market. (55% more workspace than Tin Lizzie 18x6" Arm. 25% more than HandiQuilter Avanti). Side Mount Hand Wheel eliminates the need reach around to the back of machine for main hand wheel. Independent M bobbin winding system allows winding bobbins while sewing, or when not sewing. Front or back operation of the machine from front or back of quilting frame. Free motion from the front and pattern motion from the back with laser stylus included and optional quilting design templates or paper patterns on the table. Stitch Regulator with X and Y encoders for the machine and platform which comes with machine. Cruise Control Speed Settings as a % of 2200SPM maximum. 1/4" Tall, 1/2" Diameter All Metal Presser Foot for Rulers and Visibility. Tack or Stay Stitch to make three stitches in place, and stop with needle up or down. Needle Eye Guard to be installed at time of machine set up. Presser Foot Lever to be installed at time of machine set up. Two spool thread stand to be installed at time of machine set up. 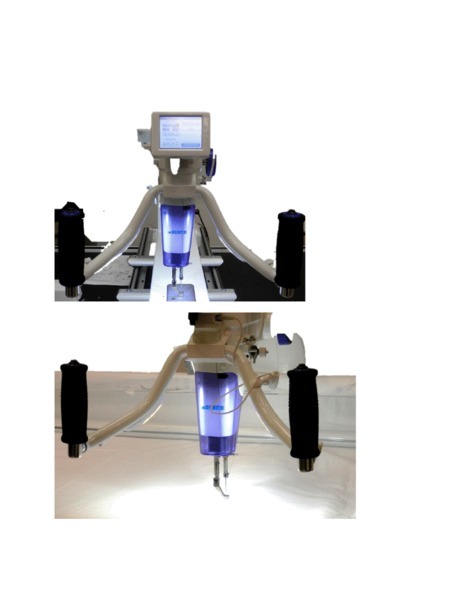 Automatic or Manual Activation of both Top and Bottom Thread Trimming at the same time, the only quilting machine on the market with these features. Super Bright LED No-heat lights above needle (4) and on both left and right handles (3 each). Compatible with Grace Quilt Motion, Grace Creative Touch Pad Upgrade, Robotic Quilting Systems. Juki Tech Brian Debrick and National Educator Karen Pharr train AllBrands staff on QVP. You can register your Juki machine purchase online with our new Registration page. Click here to Register. 10 Ultra Bright LED Light Bulbs over the needle and pattern area illuminate your workspace like never before, making it easy to see detailed work, while simultaneously reducing strain on your eyes. Convenient automatic scissors simultaneously trims the top and bottom thread. 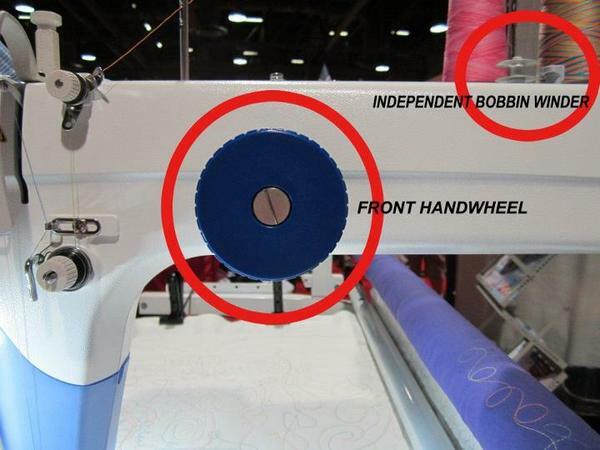 No other Long Arm Quilting Machine has this feature! 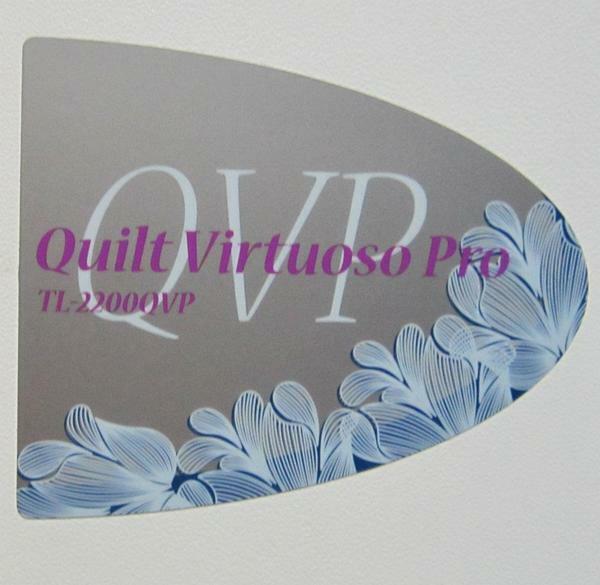 The TL2200 QVP comes equipped with ergonomic handles for ease and comfort while quilting. The ergonomic handles swivel from vertical into horizontal micro handles for precise close up detailed work! No need for extra set of micro handles. The built-in bobbin winder has its own motor independent of the machine, so you can wind bobbins while you continue to quilt or while the machine is idle. Eight Ball bearing wheels hug the track of the optional frame in a V shape, ensuring smooth even quilting at all times.Machine will not "jump" off the rails. The take-up bar allows you to roll up your quilt all the way without making any adjustments to the optional frame, unlike most other quilting machine frames where you have to adjust the rails up and down as the quilt fills the machine throat. Idler or dead bar below take up bar holds the fabric down to the bed to prevent flagging of fabric which causes skipped stitches. The TL2200QVP is made and assembled entirely in Juki's leading industrial manufacturing plant in Japan - not in China or Taiwan. 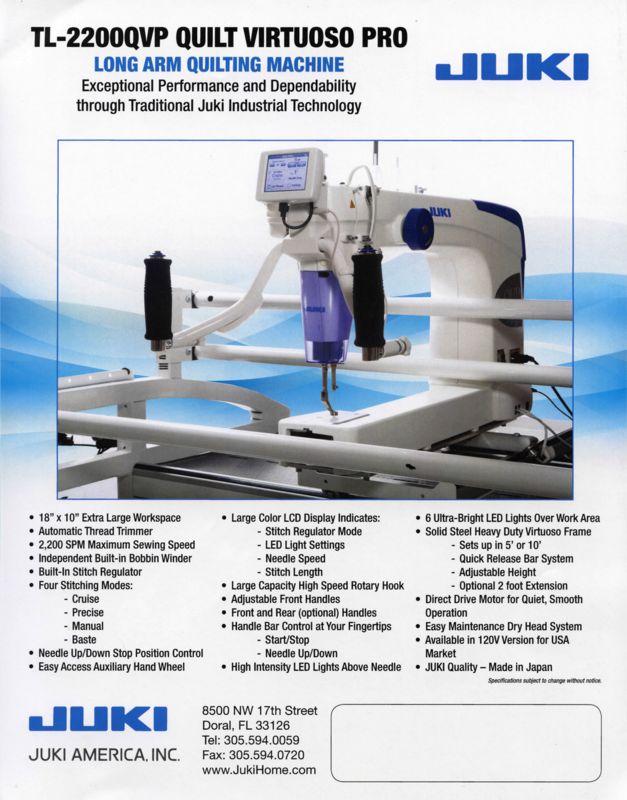 It used technology developed for Juki's line of industrial sewing machines which have been proven benchmarks for decades of production and use. The Optional All Metal Frame is made by Grace in Salt Lake City, Utah. 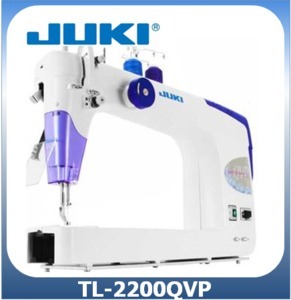 Juki is the Leading manufacturer of industrial sewing machines worldwide. 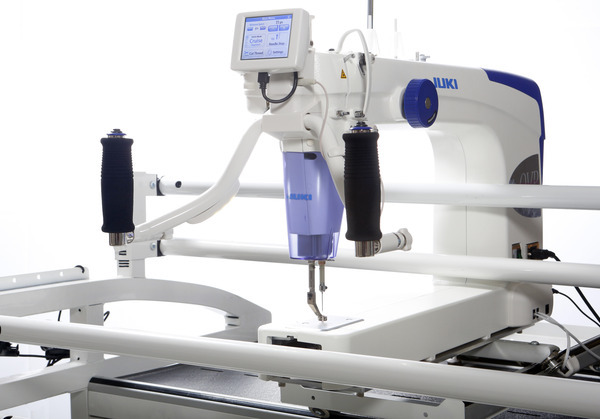 Juki has taken this industrial knowledge and experience and put it into this long arm quilting machine for home use. 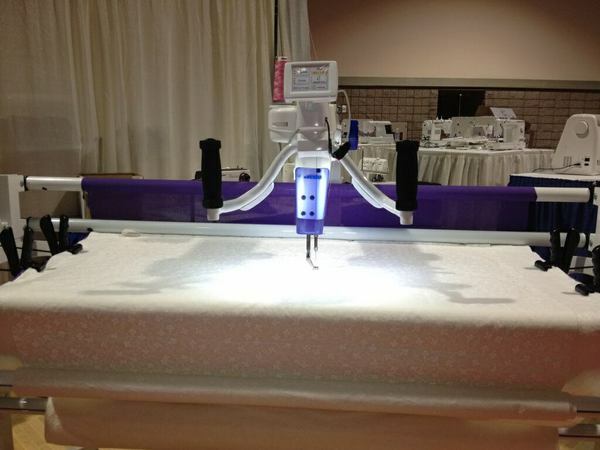 The result is a unique heavy-duty high quality long arm quilting machine that all quilters are sure to love. 400W Motor is the strongest in the industry. Obtain faster results! The TL-2200QVP offers professional speed so you can complete projects in record time. 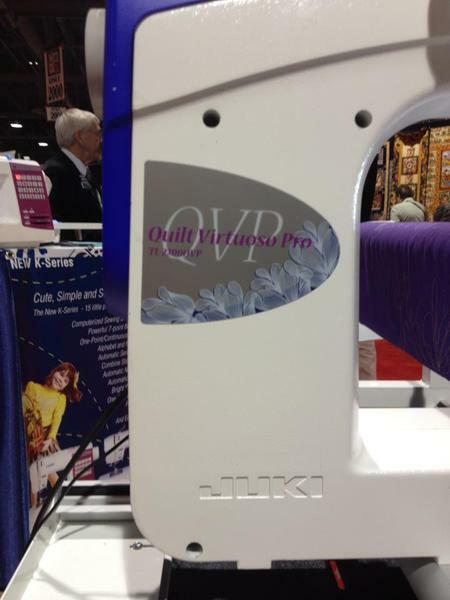 You can quilt faster on a Juki QVP than any other quilting machine made for the home market. The stitch balance control allows you to deliver more consistent stitching according to your needs for a perfect finish on your quilt. Pretension knob guarantees correct length of thread tail after thread trimmer is activated. Start, stop, speed up and slow down the motor of the quilter delivering the exact amount of stitches per inch that you have set in with the built-in stitch regulator on the TL-2200QVP Quilter. 10-12 SPI Stitches per Inch Recommended. Work on your project the way you see fit! With three different stitch modes (Cruise doesn't stop stitching, Precise stops stitching when you stop, Manual Free Motion up to 2200SPM, and Baste for .5 to 1.5" stitch length) you can set up your stitching preferences and obtain the results you are looking for without added effort. Maintain absolute control with a top of the line Color LCD touch panel display where you can manage the stitch regulator, light settings, needle speed, stitch length, sound, screen brightness and all you need to complete your masterpiece. The machine is equipped with an automatic thread trimmer device that simultaneously trims the needle and bobbin threads to 1/4" at the sewing end by lightly pressing the push-button. It uses the same industrial thread trimming mechanism that was invented by Juki for their high speed straight stitch machines starting with the DDL555 to DDL8700 and has been in proven use for decades. Added comfort and maneuverability with the adjustable front and optional rear handles that will give you complete control over your project from any position around the machine. Front handles are used for free motion quilting. Read handles can be used for following patterns with laser stylus included. Start/Stop with Right Handle Button - Needle Up/Down with Left Handle Button. Controls at the reach of your finger tips. Internal motor provides a quiet smooth operation, without any belt/noise. Thanks to the advanced dry-head technology (4 sealed permanent lubrication metal bearings on main shaft and 5 silicone impregnated and brass bushings throughout rest of machine) no lubrication is required except for the rotary hook section before each quilting project. This eliminates oil stains on the sewing product. For quiet and smooth operation. Obtain faster results! The TL-2200QVP offers professional speed so you can complete projects in record time. Juki Japan Made Brushless AC Motor, 100-400 Watts. Needle: GB, Organ or Schmetz 134R and equivalents. Lubricating oil: New Defrix Oil No.1, or any clear sewing machine oil. Juki TL2200QVP on optional Grace Metal Frame with 5 Rails. Juki QVP Handles, Control Panel and LED Lighting over Needle. Juki TL2200QVP Control Panel with Touch Screen Icons. 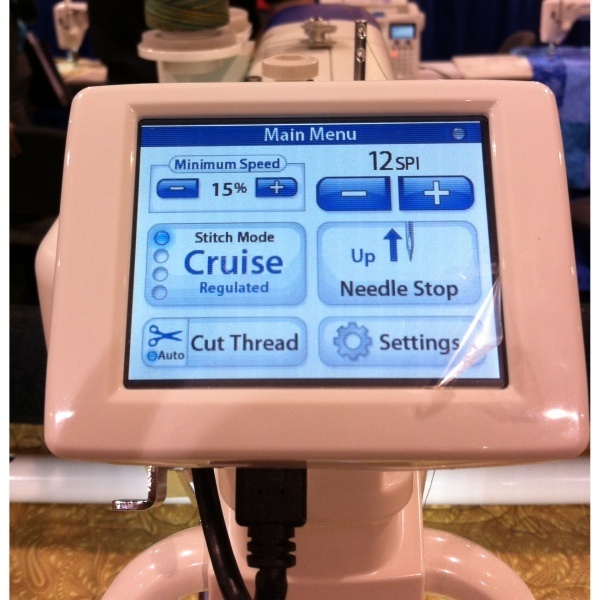 Increase or Decrease Stitches Per Minue Speed, Set SPI Stitches Per Inch, Set Stitch Mode: Cruise Precise Manual or Baste, Needle Stop Up or Down, Auto Thread Cut or Not, Other Settings LED Lights, Etc. Juki TL2200QVP Underarm LED Lighting plus Needle Lighting. Juki optional TL2200QVP Frame can be set up as crib 5' or king 10' Optional 2' Extensions to make into 12' King width. Optional Rear Handles can be mounted at back with transfer of Control Panel location from Front to Back Position simply by unplugging cable from front to back. Juki TL2200QVP Main Shaft Hand Wheel with timing marks. John, I will go ahead and call your 800 # and order the Juki. Thanks. It is 3 a.m here so I suppose 4 a.m. there - guess I need to wait a bit!! 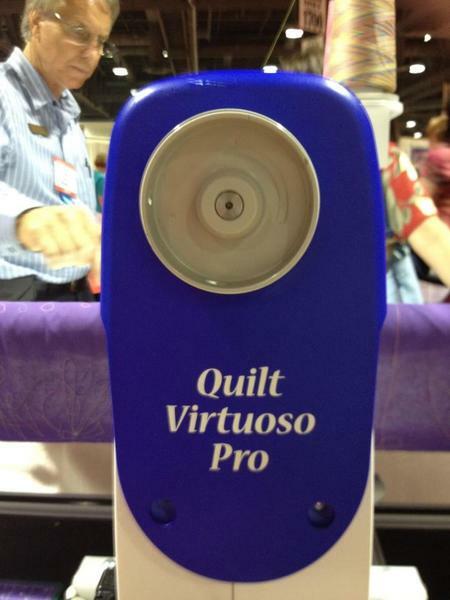 Sally Sally, Handi Quilter does not have the automatic or manual button thread trimmers as Juki QVP has. They also do not have direct drive from motor to shaft. Also not as large arm space. 18x8" vs 18x10" a difference of 25% more space for your Juki quilt roll up than HQ. These are the two major differences between Handi Quilter HQ and Juki QVP. Sally, the Juki has automatic and manual button thread trimmers, so you never have to pull up threads through the quilt when starting, moving to another spot, tying off, or changing threads. Juki also has a direct drive motor with no belts so there is never any belt slippage. Direct drive makes the machine more responsive and quieter, specifically the motor is built into the head on the main shaft and the lower shaft is turned by a gear, there is no belt. Juki QVP is worth waiting for. Sally, the no name quilting machine at http://www.sewingmachinesplus.com/18x8-longarm-upgraded.php is made by Tin Lizzie in China which we got rid of because of encoder and electronic problems. According to Tin Lizzie management, they will not even warranty the machine anymore because the "upgraded" electronics are not made by them, but by Eclipse who used to make the electronics for Tin Lizzie that we had so much trouble with. So you have to deal with three companies (machine, frame, electronics) who will blame each other for any problems you have. That will never happen with Juki. Juki is made in Japan without the electronic problems. We have had less repairs on Juki electronics, than any other brand including Janome and Brother. We repair all the brands. The optional Juki all metal frame is made in the USA with 8 wheel tracks and heavy duty platforms. The machine weighs 57 pounds which is considered lightweight as far as quilting machines are compared.